Patrick Strange is transforming Transpower, logically and deliberately moving the business from a maintainer of the national grid to a company capable of undertaking the massive investment programme now underway. A $3.8 billion capital programme is now in train, while Transmission Tomorrow and the Enduring Grid, two publications championed by Patrick, set a longer-term direction for the business. While that work, and a series of internal restructurings, has been important, Transpower highlights Patrick's vision and the values he brings to the job - 24/7 - as key in embedding a culture of rigour and safety to support the direction the business is now taking. Colleagues say his laid-back style and relaxed manner mask exacting standards and an intolerance of lazy thinking. He values rigorous intellectual investigation and thorough preparation. And while he's happy to 'front' on the hard issues, he backs staff and executives to make the right choices. He wants people to learn from their mistakes and to succeed. A champion of open leadership, Patrick is never seen wearing a tie, and has introduced open plan offices. He keeps a pair of boots next to his desk so he can get into the field to see projects coming to life and fosters strong relationships with staff across all levels, trusting them to show initiative and take responsibility. He is also leading Transpower's campaign to lower injury and accident rates from the front. Patrick launched the STAR awards last year to recognise commendable safety consciousness in staff and formed and chairs the Central Safety Leadership Team, on which executives from the company's major contractors work together to improve work practises. It is that unique style which has allowed the company to remain on track, delivering a range of innovative investments while also working to meeting concerns of communities affected by its programmes and navigating its way through a new regulatory environment. Patrick sponsored the first transmission STATCOM in New Zealand, one of the first of its kind in the world, to strengthen security of supply in the upper South Island. The use of bypass lines for the Pole 3 project, and the roof-lift design for the valve halls at Haywards and Benmore, were novel initiatives which each saved the project significant time and money, Transpower says. He drove production of a new, simplified easement agreement which was supported by Federated Farmers. A new approach on compensation for land disturbance during construction was another example of `fresh thinking' that marked a major step forward in landowner relations, Transpower says. Patrick's strategic focus ensured a smooth transition to the new regulatory environment following completion of the Electricity Review last year. It was also key in Transpower's work with the Commerce Commission to establish the company's forward maintenance and capital plans, all the while ensuring that issues important to it and the industry were recognised and addressed. Transpower says Patrick has strong relationships within the industry where his calm and measured approach is respected and was a factor in his appointment to head the Winter Power Taskforce in 2003 and the response to the dry winter in 2008. His ability to take a `helicopter view' and work with industry to achieve the best outcome is also recognised by government which values his advice knowing it will be free of self-interest. 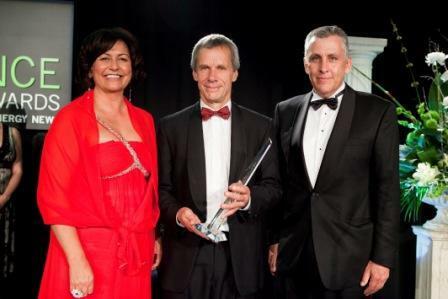 In 2011 the Energy Executive of the Year category was sponsored by Transfield Worley.